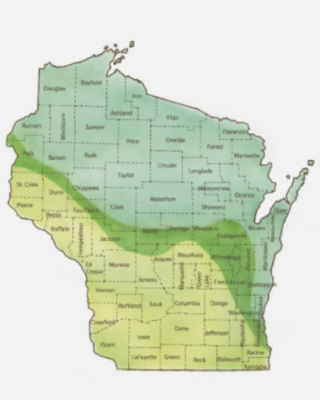 Winding across the heart of Wisconsin is an s-shaped area known as the Curtis Tension Zone. Marked by a distinct separation in the landscape, this zone is where the southern prairie region and deciduous forests meet the northern coniferous forests. It’s also where scientists have noticed pronounced impacts of climate change, something co-collaborators Michael Notaro, associate director of the Nelson Institute Center for Climatic Research (CCR), Rose Pertzborn, Space Science & Engineering Center outreach program manager and a group of students and citizen scientists plan to investigate as a part of a three-year Baldwin Wisconsin Idea Endowment initiative. A prestigious endowment established to fund projects that foster public engagement and the advancement of the Wisconsin Idea, the grant was awarded to Notaro and Pertzborn for their project titled, Advancing Climate Science Education, Inquiry, and Literacy Across Rural Wisconsin Communities. In essence, this funding will allow Notaro and Pertzborn to provide a number of educators across the Curtis Tension Zone with the equipment and training they need to collect data on climate variability and change and its impacts while also making climate research a part of their curriculum and community engagement efforts. He also added that districts participating in this program will become key partners in campus and international climate research as the data collected by the students will be added to NASA’s international Global Learning and Observations to Benefit the Environment (GLOBE) program. NASA states that to date, there have already been more than 130 million measurements from more than 10 million students in 113 countries around the world uploaded to the GLOBE site. In order for the data from this project to become a part of the GLOBE program, however, classrooms must be utilizing GLOBE approved and calibrated equipment, which is something the Baldwin Wisconsin Idea Endowment funding will help provide for each participating district. Pertzborn and Notaro will also be providing all of the necessary training to the educators and participating in follow-up visits to the classrooms and communities as needed. “We have an introductory three-day training that has been scheduled for August with the Butternut School District, which is the first district we will be working with,” said Pertzborn. Following the initial training and experimentation in the Butternut School District, which is north of the tension zone, Pertzborn and Notaro will partner with districts south of the Curtis Tension Zone, including those in the Cross Plains area. During this time, Pertzborn and Notaro will also be working with the Ice Age Trail Alliance, which includes a number of volunteers who will be studying the trails and providing meta-data, or observational data, from areas around the Curtis Tension Zone. Pertzborn said this will allow scientists, citizen scientists and students to observe changes in all directions and pinpoint where the most pronounced climate change impacts are happening. It will also allow many districts and communities to be a part of the data collection, engaging more community members in the sciences and connecting community members of all ages. For Notaro and Pertzborn, it’s this type of community engagement that is at the heart of their Baldwin Wisconsin Idea Endowment project, which they hope will continue to bring communities together to learn about and participate in the sciences well beyond the three-year project timeline. They also see this project as an opportunity to expand the sciences, exposing kids in isolated rural communities of the state to Earth science and giving them access to scientists.